Venison meat is sliced with a Weston Jerky Slicer, marinated in a Weston Vacuum Sealer Bag, cooked with freshly mandoline-sliced veggies, and served over homemade sriracha-flavored noodles. We're not talking about an ordinary stir fry here. Use a Weston Knife Set to trim your venison of excess fat and silver skin. 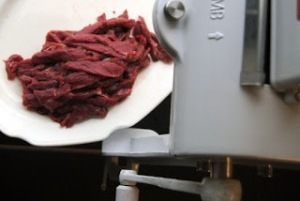 Feed the venison through your Weston Jerky Slicer to make perfect strips for your stir fry. 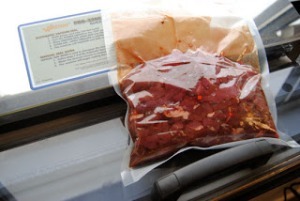 Place the strips into a Weston Vacuum Sealer bag with the marinade and seal. Refrigerate at least 8 and up to 48 hours. 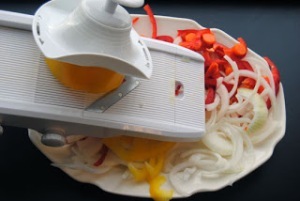 Use the Weston Mandoline Slicer to slice your peppers, onions, and carrot. Heat your wok over high heat. Once hot, pour in the oils, garlic, ginger, and onion powder. Once you begin to smell the garlic and ginger strongly, drop in the marinated venison strips. 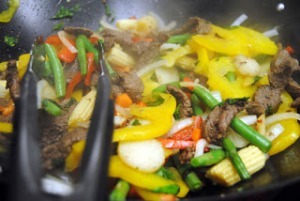 Flip often, and as soon as the venison is no longer pink on the outside, drop in all of the veggies. Continue to cook for a couple minutes or until your veggies are lightly sauteed. 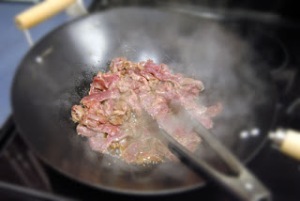 Be sure to flip very often to cook everything evenly - your stir fry will cook very quickly. Remove wok from heat and toss in sriracha noodles.